The next Institute will be held in New York City, NY on August 12 – 16, 2019. Please return to this page in the upcoming weeks for more information. Remember: All applicants must be approved for admission to the Institute by our Professional Certification Board (PCB). Decisions of the PCB are made on a rolling basis. Note: You must be officially approved before you pay for the institute. If you have any questions, please email us at: institutes@inspectorsgeneral.org or call 212.237.8001. 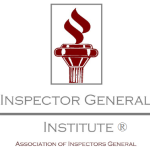 If you need help with payment, please contact Edward Evanick at eevanick@inspectorsgeneral.org or at 646-557-4793.